Shannon Forest is a small neighborhood on the Thomasville Road corridor just West of Killearn Estates, but home sales make it appear to be much bigger. This popular NE Tallahassee subdivision had a big year last year, and it appears the momentum has continued for 2016. When you combine a prime location with A-rated school zones, it's no wonder that homebuyers are attracted to Shannon Forest. In our past reports on home sales in Shannon Forest, we advised that the prices were unusually low and that they wouldn't last, and today's report will confirm that we were right. There are still some great values to be found, but rising values and rising prices will be a steady theme for quite some time. It is important to note that the narrative contained below is for sales through December for all previous years, but through the third week of March in 2016. The graphs and the closed sales table will be continuously updated into the future (meaning bookmark this page if you always want to know the current status of homes in Shannon Forest). Average home prices are up roughly 18% over the home prices posted in 2015, a shockingly huge spike if we didn't know the reason. But we do. 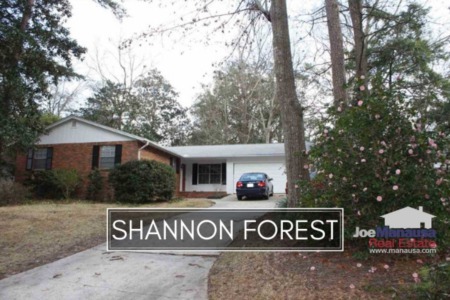 The average recorded sales price has been $208,375 for Shannon Forest through the third week in March. There will still be homes that sell below $200,000, but they will become fewer and fewer. There were 19 closed home sales in 2015, which meant that last year we saw more Shannon Forest homes sell than in any year prior going back to 2005. Sales remain brisk in the first quarter of 2016, as four homes have already sold. There are currently 10 homes on the market, with two under contract. Expect 2016 to bring another strong year for home sales in Shannon Forest. Average home values in Shannon Forest have risen four years in a row, up from a post-bubble record low set in 2012. Home values rose 2% in 2014, but they shot up more than 5% in 2015. They have continued to rise again in 2016 and I would expect we'll see the trend of appreciation to continue. 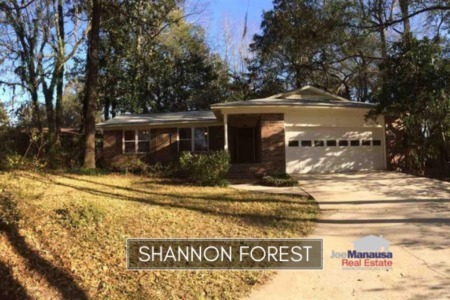 In 2016, the average value of a home sold in Shannon Forest has been $102 per square foot. The average home size sold in Shannon Forest typically falls in a range of 1,800 to 2,000 square feet, and 2015 saw home sales at the lower end of this range. Currently in 2016, the opposite is true, as the average home size this year has been 2,278 square feet. Homeowners who want to sell should get them listed immediately to take advantage of the high demand for NE Tallahassee homes along the Thomasville Road corridor. The following list shows home sales going back to 1991 in Shannon Forest. I hope you enjoyed our March 2016 update on home sales in Shannon Forest, please feel free to drop me a note if you have questions not covered in this report. Does The Size Of Your Home Determine It’s Appreciation Rate?